Force ouvrière union federation faces crisis as new Protests are launched in France against Macron’s ‘reforms’. Around 160,000 people joined demonstrations across France on Tuesday, the interior ministry said, heeding union calls for President Emmanuel Macron to “maintain the social model”, which has come under threat from his ambitious reforms. Around 20,000 people turned out in Paris, the largest of some 100 rallies across the country. The head of the hard-left Confederation of Labour (CGT) union Philippe Martinez estimated turnout higher at 300,000 nationwide. The CGT said about 50,000 people marched in Paris at the urging of six of the country’s labour unions. “We’re not complaining, we’re revolting!” the students, workers and retirees chanted as they marched in the first demonstration since the end of the summer holiday, referring to President Macron’s recent suggestion that the French complain too much. Libération covers the 50, 000 strong Paris march organised notably by the union federations FO (which has undergone a ‘left’ turn this year) and the traditional left CGT. A Paris, le défilé organisé notamment par FO et la CGT a réuni 50 000 personnes selon les syndicats. Une mobilisation en ordre dispersée, sans la CFDT, qui a tout de même plus rassemblé qu’au printemps. The presence of Force ouvrière (FO) in these and other protests, traditionally a cautious union, based on a complex series of alliances between right-wingers, anti-Communists, and the ‘Lambertist’ trotskyist current, has not gone unnoticed. Last week Le Monde published this article. Michel Noblecourt observes that under the new leadership of Pascal Pavageau the FO has undergone a “une rupture radicale avec le passé “. The federation is now dominated by supporters of Pavagau in alliance with a variety of leftists (including for example, Marc Hébert an ‘anarchist’), but above all the sovereigntist ‘Trotskyists’ of the Parti ouvrier indépendant (POI). Interestingly Noblecourt also mentions that said POI is now active in the CGT (once closely led by the French Communist Party, the Parti Communiste français, PCF). That would perhaps explain why a somebody ‘representing’ the ‘CGT’ was present at a sovereigntist Camden rally for ‘left-wing’ Brexit before the UK referendum. POI are not to be confused with their arch rivals, the Parti ouvrier indépendant démocratique (POID – how we chuckled at the ‘weighty’ name). The two split, very acrimoniously, a couple of years ago. POID ran their own pro-Brexit beano in Paris around the same time, attended by anti-internationalist forces from British unions, including the Aaron Banks backed Trade Unionists Against the EU, and which received fraternal greetings from the Morning Star. The two are united in opposing internationalism in general and the European Union in particular. Both groupuscules, though small in number – not that small, POID have a few councilors, like Christel Keiser, (Seine-Saint-Denis) – live, like the Socialist Party in the UK, from their hold on paid union positions. Who says Lambertist says the dirty deeds needed to keep these places. Whether they are linked to this skulduggery or not we do not, as yet, know. From French Trotskyism to Social Democracy. “68, et Après. Les héritages égarés. Benjamin Stora” Review. 68, et Après. Les héritages égarés. Benjamin Stora. Stock. 2018. The present wave of strikes and student protests in France have drawn comparisons with the stoppages and protests against the 1995 ‘Plan Juppé”. This reform of state health and retirement insurance, including the railway workers’ pensions, struck at the heart of the French welfare state. There is a strong resemblance between this social movement and the opposition of public sector workers and undergraduates to President Macron’s efforts to ‘modernise’ the French rail system and Universities, (Le Monde 28.3.18). That section of the far-left is, of course embroiled in the continuation of the Tarnac trial. Others from a close milieu are involved in resisting the clearing of the last self-organised squats at Notre-Dame-des-Landes. Benjamin Stora’s 68, et Après is written from a standpoint both familiar internationally, the fall out from the crushing defeat of the French left in last year’s Presidential and Parliamentary elections, and one far less well-known, the history of a section of Gallic Trotskyism, the ‘Lambertists’. It is also an autobiography, from his origins in as a North African Jews, his education, his many years of activism, and university career. Stora has produced important studies of French Algeria, the war of liberation, and post-independence Algerian history, including the exile of its Jewish population. There is a finely handled account of the tragic death of his daughter in 1992. Stora’s commitment to study the Maghreb did not wholly override political commitment. Opposition to the Jihadists – and be it said, the Military – during the 1990s civil war in Algeria – led to Islamist intimidation. After a small coffin inscribed with words from the Qur’an, and a death threat addressed to Unbelievers, Jews and Communists arrived at his home the historian was forced to leave France and spend time in Vietnam, the occasion for further fruitful reflection on post-colonial societies. The history of this highly disciplined current, around the figure of Pierre Lambert (real name Boussel) in 68 known as the Organisation communiste internationaliste (OCI) is long and, to say the least controversial. But their imprint is not confined to the fringes. Lambertists have played an important part in the recently governing Parti Socialiste (PS). Amongst one-time members are the former Prime Minister, Lionel Jospin, and the ex-Socialist leader of La France insoumise, Jean-Luc Mélenchon. Stora, like PS General Secretary until last year, Jean-Christophe Cambadélis, was part of a several hundred strong Lambertist faction which joined the PS in 1986. Cambadélis, in his most recent book, Chronique d’une débâcle (2017) makes passing reference to a Trotskyist past (his ability to spot sectarian manoeuvres is undiminished). L’après 68 gives an extensive account of the organisation, from weekly cell meetings, whose minutes were rigorously kept and transmitted to the party HQ, to their exploits in the student unions and ‘mutuals’, friendly societies which play an important part in assuring student health and other forms of insurance. Stora’s La Dernière Génération d’Octobre (2003) covers, he remarks, the post-68 culture and politics of his time in the OCI. The present volume gives probably more attention to the way in which his faction from this generation moved from full-time Lambertist activism, often paid for by one of the fractured French student unions, the UNEF-ID, in some cases by Teachers’ unions) into the late 1980s Parti Socialiste. Going from a clandestine fraction, led principally by Cambadélis, suspicious of surveillance by a group whose way of dealing with dissidence was not too far off the British WRP’s, they broke with Leninism. This was not just in opposition to the vertical internal regime, and the reliance on the “transitional programme” but, as they saw it, to establish a left-wing force within the democratic socialist spectrum represented in the post Epinay PS. An organised PS current, Convergences socialistes, with all the self-importance that afflicts parts of the French left and academics, they numbered around 400 members. Of these a few moved into open professional politics. As a coherent body it is hard to find much trace of them in the shifting alliances within the PS, although one may find some remaining allies of Cambadélis as he clambered up the party hierarchy. Just how adept former Lambertists could be in the PS game is registered by Stora’s portrait of an individual who had joined the PS some years before, Jean-Luc Mélenchon. The present chief of La France insoumise, with a seat in the senate’s august halls, shared a wish create a new vanguard with his own tendency, the ‘Gauche socialiste’. He was equally marked by burgeoning admiration for François Mitterrand. This did not go down well. Stora recalled the President’s role in the repression of Algerian insurgents…(Page 49 – 50). In a critique of Mélenchon’s present politics, Stora draws comparisons with the old Communist Party’s wish to impose its hegemony on the left, and keep its activists preoccupied by frenetic activism (Pages 150 – 153). The root cause of the present débâcle is Parliamentary left lost touch with the people, part of an autonomous political sphere. The history of how a section of the radical left made the transfer from revolutionary full-timers to PS MPs and functionaries (and a galaxy of dependent positions) is not unique. It could be paralleled on a smaller scale by the career of the UK Socialist Action in Ken Livingstone’s London Mayor administration. The insulated, amply rewarded, lives of politicians, is, it is often said, one of the causes of the break down of the traditional French parties of right and left. Stora does not neglect his own current’s involvement in the student mutual, MNEF, corruption scandals, (Page 129). Whatever remains of the difference between ‘revolutionaries’ and ‘reformists’ fades into the distance faced with a managerial-bureaucratisation enveloping the current. The same processes, born of their reliance on union positions and opaque funding are not without effects on the remaining loyal Lamberists in the le Parti ouvrier indépendant (POI) , and their split, the Parti ouvrier indépendant démocratique (POID). 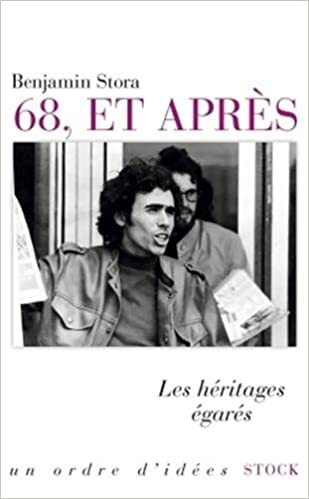 Après 68 is above all is a rousing condemnation of the “neo-nationalism” grounded on French “identity” and fear of “decline”. This, from the 2005 European Constitution Referendum (which divided the French left including, Stora notes, some on his section of the radical left) dominates French politics, left and right, up to its presence in the ‘synthesis’ offered by President Macron. French political space, he observes, no longer dominated by the Parti Socialiste, is open. From 1968, writes both the historian and left winger he keeps two passions, for History (the source of his productive career) and the internationalist defence of those without rights, the desire for a common human civilisation. Staying hopeful that hopes for a new world have not been extinguished, L’après 68 is full of important messages from an old one. (2) Pages 467– 469. Les Trotskyistes, Christophe Nick. Fayard. 2002. (3)See for example, the series in le Monde by Nathaniel Herzberg in 1999 on the subject commented on here: De la « génération » comme argument de vente… A propos d’une série d’articles sur la « génération MNEF ». Lambertists (POI): Revolution to Cross Mediterranean. Former allies of Gerry Healey (WRP)*. But as part of our revolutionary duty (and the deep friendship we Plabolites feel) we feel obliged to report the Parti ouvrier indépendant’s latest stand. Je n’ai pas annoncé ma candidature à l’élection présidentielle. I have not announced that I will be a candidate in the Presidential election. A la question qui m’a été posée sur ma candidature, j’ai répondu que les développements révolutionnaires en Tunisie en Egypte qui voient les populations de ces pays non seulement chasser les dictateurs mais aussi poser la question d’une assemblée constituante ; pourraient bien traverser la Méditerranée et balayer la question de l’élection présidentielle en France. On the subject of my candidacy, I have replied that the revolutionary developments in Tunisia and Egypt – which have seen the people get rid not only of dictators but pose the question of the Constituent Assembly – may well cross the Mediterranean and sweep away the whole issue of Presidential elections. 22nd of February. From Here. * That is until their 1971 split. in the ICFI over the POR (Bolivia) and other South American groups, and the Healyites stand for the LWR (Ireland) and the RCL (Sri Lanka) . In At present the Lambertists have their own planet-wide alliance, the Entente Internationale des Travailleurs et Peuples. Unfortunately it does not seem to a current website of its own. Note Charlie Pottins berates me on Facebook for not pointing out that it was SLL not the WRP that allied with Lambert. As few people under the age of 130, and former members of the RCP know, or care, who the SLL was, I consider this brief deparature from strict leftist Trainspotting rules justified: in any case it was the same Healey. La nation veut vivre, la nation doit vivre, et, pour cela, il faut rompre avec Maastricht et l’Union européenne, et avancer vers l’union libre des peuples et des nations libres d’Europe. Schivardi received 0,34% the vote in the (first round) Presidential election.